The age of Kingdom includes some exciting developments in the way God speaks to us. Historically our evangelical heritage was very cerebral, and truth centered. Sound doctrine is important, not just for doctrine’s sake but because it influences our experience with God. The charismatic era brought freedom for exciting prophetic experiences of hearing God’s voice and seeing into the spiritual realm. The most recent development over the last few decades is that we are allowing ourselves to explore what God has written in the desires of our hearts. 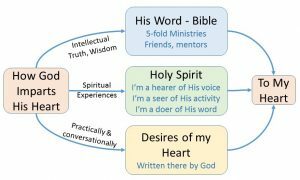 This third ingredient (Heart, in the diagram below) of communicating with God opens a door to conversations, fellowship with the Father and even being invited to His council to receive and conceive of Kingdom strategies. We’ve all had the wonderful experience of the Father’s love and forgiveness that led to the invitation to both heaven and Kingdom. The gratitude naturally leads to heartfelt worship for the adventure of following Jesus. We’ve also felt the shame of doing something we later found out was not God, that grieved His heart and our heart . . . and we’ve vowed not to let it happen again. We’ve also seen the spirit of God moving and prophetically understood where it needed to go, and then watched as someone got out of the spirit and ungracefully quenched the whole thing. It grieves our hearts . . . and we’ve vowed not to let it happen again. The Theology – These well-intentioned “vows” show up in two doctrinal positions that try to build a fence around mistakes. Unfortunately, the friendly fire has the unintended consequence of taking us out of one of the primary means that God uses to speak to us – the desires He wrote in our hearts. Human depravity – Our evangelical heritage has allegedly solved the problem of mistakes by concluding our hearts are so desperately wicked (Jer. 17:9) that we just don’t expect anything good to come out of them. Once we adopt this position, it’s very difficult to trust any of our heart’s desires and we are confined to being servants and obeying “leadings.” It costs us our creativity, initiative and dreams. Separation of spirit and soul – Our charismatic heritage has roots in Watchman Nee who came along while depravity was still in vogue and taught that we solve this dilemma by emphasizing the role of our spirit with the assumption that our fleshly nature resides in our soul (mind, will, and emotions). Once again, the unintended consequence is our heart. We carry a filter that limits God to our spirit and ignores what he wrote in our hearts. We get really spiritual in a mystical sense and disengage from our culture . . . and mountain and Kingdom and people. Impacts on discernment – Both of these extremes lead to philosophical dualism (or Gnosticism) which implies that spiritual things are good and everything else is suspect (soul, heart, body). Since religious mysticism isn’t that much fun, the rapture was a logical solution, i.e., give up and get out. Can you see why there is still a pull toward full-time ministry, meetings, movements and pulpits? Everything else is carnal. Both extremes leave us with a receptivity for spiritual things and a bias against natural or heart-related initiatives. If I regard myself as a “spirit man” I’m armed to the teeth against any deception or compromise that might come through the soul or heart. But I’m prone to accept things that come through my spirit or another person’s spirit. This lack of discernment of spiritual things (deceiving spirits, false anointings, bad doctrine and mystical pacifism) usually leads to heartbreaking and costly deceptions that take us down blind alleys while following “revelatory” leaders who live from our offerings. Without this false filter, we are free to discern and flow with everything God communicates through His word, His spirit and the desires He wrote in our hearts. Our spirits have a legitimate function, but so does our heart and soul. Practically, all three overlap and scripturally, all three are used somewhat interchangeably throughout the Bible. Even people who talk about their “spirit man” always include the functions of their personality, memory, intellect, emotions and will in the course of their spiritual experiences. Their soul goes with their spirit. The experience of our spirit being quickened, and our hearts leaping are both real, perhaps even the same thing? The bible emphasizes our heart and God’s Spirit dwelling in us much more than our human spirit. We do need both our heart and our human spirit. We both guard and release our hearts by using our spirit to put the kingdom first in our hearts. Kingdom is when our hearts and God’s heart are flowing together . . . co-laboring and co-creating with what we see the Father doing. 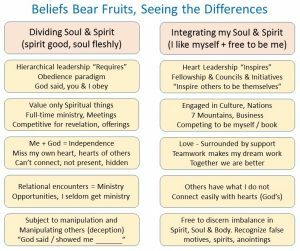 Summary – Our book opens when we give ourselves permission to explore the desires God wrote in our hearts “and” our when spirits function properly. They are working together, not separated or divided. 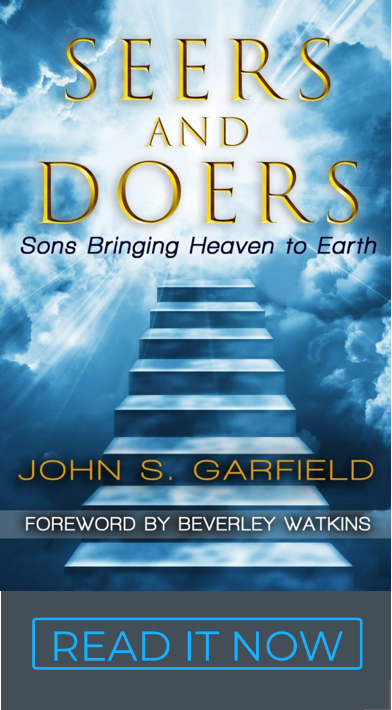 Hearts after God with an ability to dream are a prerequisite for Kingdom, courts, councils and our inheritance of nations as sons of God (kings). A healthy and active human spirit will confirm the Father’s heart and release our hearts into passion, creativity, boldness and initiative. Our spirit releases our heart. Post Script – This is a big topic and there are some great (and brief) articles worth reading by Harold Eberle, Gordon Ferguson, Recovering Grace and Let My People Think. Hebrews 4:12 doesn’t support separating soul and spirit. Spirit in the Greek (pneuma, 4151) actually means “the rational soul.” We are spiritually and mentally most healthy when we are fully integrated. We are washed from the sin that contaminates our soul, not just separated from it. A summary graphic contrasting the pathways is given below.